The Indian flag was designed as a symbol of freedom. In the centre of the white band is the the Dharma Chakra (wheel) in navy blue. The chakra or the Wheel of Law is from the Sarnath Lion Capital constructed by Emperor Ashoka. It has 24 spokes. The saffron represnts courage, sacrifice and the spirit of renunciation; the white is for purity and truth; the green is for faith, prosperity and fertility. 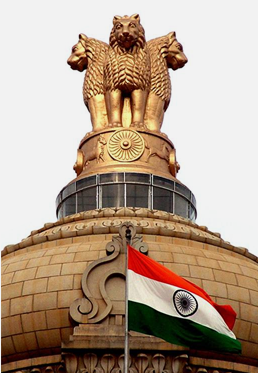 The National emblem of India is a replica of the Lion of Sarnath, near Varanasi in Uttar Pradesh. The Lion Capital was erected in the third century BC Emperor Ashoka to mark the spot where Buddha first proclaim' his gospel of peace and emancipation. The National emblem is thus symbolic of contemporary India's reaffirmation of its ancient commitment to world peace and goodwill. The four lions (one hidden from view) symbolizes power, courage and confidence. They rest on a circular abacus. Four smaller animals guardians of the four directions gird the abacus are the lion of the north, the elephant of the east, and the horse of the south-and the bull of the west. The abacus rests on a full bloomed lotus. The motto Satyameva Jayate inscribed below the emblem in Devanagari script means 'Truth Alone Triumphs'. The following is Rabindranath Tagore's English rendering of the stanza. Thou art the ruler of the minds of all people, dispenser of India's destiny. The name rouses the hearts of Punjab, Sind, Gujarat and Maratha, of the Dravid and Orissa and Bengal; it echoes in the hills of the Vindhyas and Himalayas, mingles in the music of the Yamuna and Ganga and is chanted by the waves of the Indian Sea. The salvation of all people is in thy hand, thou dispenser of India's destiny. Victory, victory, victory to thee.